The book was first published in 1966, it played a pioneering role in helping to spread awareness of this unique member of the chess family outside its country of origin. It was the first book on shogi by a nonJapanese author. 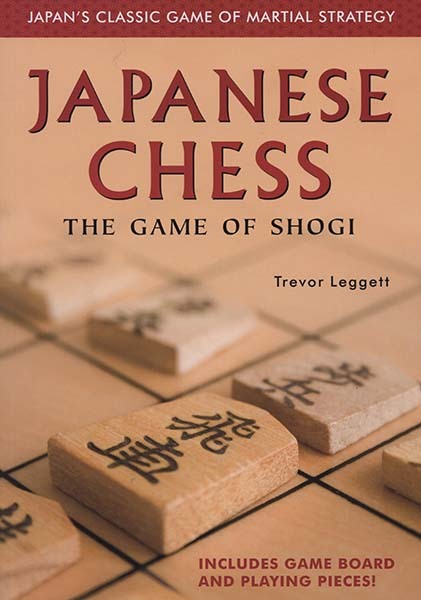 There have been many changes in the world of shogi over the past four decades, including the appearance of several other shogi-related books in English, yet Leggett’s book has several unique features which make the appearance of this new edition a welcome event and which will give it a continuing part to play in the worldwide popularization of shogi. The most striking feature of shogi, and what distinguishes it from all other regional variants of chess, is that pieces captured from the opponent are retained and may be ‘dropped’ back onto the board as one’s own. This single feature affects the nature of the game in a number of ways in comparison with Western chess: play tends to be more dynamic, with material advantage being less important than the momentum of an effective attack; very few games end in draws (less than 1 % for games between professionals); and players of significantly different strength can play each other on equal terms through a carefully calibrated ‘handicapping’ system in which the stronger player removes certain pieces from the starting line-up. Arguing about whether chess or shogi is the ‘better’ game seems pointless. But it is certainly true that a large proportion of chess players who take the time to learn shogi end up becoming fascinated with the Japanese version of the game. Despite its undeniable strengths as a strategic game, the spread of shogi outside Japan has been slow. There are, I think, three main barriers. Firstly, the vast majority of the literature on shogi – including openings manuals, collections of games by professional players, and checkmating problems – is written in Japanese only. Secondly, the Chinese calligraphy that appears on each shogi piece, and which distinguishes one kind of piece from another, can be initially off-putting to those learning the game. Thirdly, outside Japan it is difficult to get hold of shogi sets and boards on which to play the game. What makes this book pioneering was not just the early date of its initial publication, but that the author takes steps to address all three of the abov-e issues. For one thing, the book is itself (of course) written in English! In addition, Leggett minimizes the confusion caused by the appearance of the pieces by printing both the calligraphy and an identifying letter from the roman alphabet (for example, “G’ for ‘Gold General’) on each piece in every diagram in the book. Finally, each book includes a paper shogi board and punch-out cardboard pieces. Harder to pin down, perhaps, but no less important, is the way in which the book is infused with Leggett’s own familiarity with Japanese language and culture.